Whether you are a hopeful award recipient or are interested in learning and networking, consider joining us at the Hannin Creek Education and Applied Research Centre on May 8. With the theme Sustainable Partnerships: Nurturing the Next Generation of Land Stewards, this year’s sustainability awards will be awarded at the Hannin Creek Education and Applied Research Centre on the shores of Candle Lake. Saskatchewan's only boreal field station, the Centre is a partnership of Saskatchewan Polytechnic and the Saskatchewan Wildlife Federation. Since 2007, the annual RCE Saskatchewan Education for Sustainable Development Recognition Event has honoured local individuals, groups and organizations that have made innovative achievements in education that builds capacity for sustainable development in Saskatchewan and that help contribute to the 17 UN Sustainable Development Goals (2015-2030). Held in a different community each year, the event shines a spotlight on projects from across the province. For more information on applying for an award or participating in the event, visit www.rceskrecognitionevent.com. RCE Saskatchewan recognized 23 innovative initiatives in education for sustainable development at its 10th Annual Sustainability Awards, May 2, in Stockholm, SK. The event included a ceremonial tree planting in Macdonald School Outdoor Classroom with His Honour the Honourable W. Thomas Molloy, Lieutenant Governor of Saskatchewan and Dr. Charles Hopkins, UNESCO Chair in Reorienting Education for Sustainable Development. The event was blessed by Cultural Advocate, Andrew Quewezance. The evening before RCE Saskatchewan's 10th annual Sustainability Awards, teachers at MacDonald School in Stockholm toured visiting RCE leaders through their innovative school yard, home to a goat, chickens, fire pit, forest area, trails, greenhouse and mental health gazebo. They also toured other teachers from the area and stayed after to learn from Hopkins. "What you're doing here is inspiring and you need to know there are people around the world just like you," Charles Hopkins told them. UNESCO Chair at York University on Re-orienting Education for Sustainable Development, Hopkins described the evolution of sustainable development and shared one of his favourite definitions, given to him by an African elder: "Enough... for all... forever." He also put the school's work in the global context. "I love to see how people maximize the resources they have. Thank you so much for everything you are doing. I hope you will become a powerful part of RCE Saskatchewan. We will continue to learn and grow together." Teacher Melissa Johanson said the evening gave her new perspective and motivation. "It was all the people coming together and realizing there's other people like us, and it's important to make those connections and to further our learning." She said listening to Hopkins strengthened her vision for the future. "What really made me think the hardest was when he asked what are the problems around here." She and her colleagues described issues such as recycling, and the disappearance of bush and wetlands in the area. "It took me a while to think of these, but I have been thinking about these issues. So now it's how we can make a difference, how we can allow the children to feel that responsibility? It's doing what we're doing but just going deeper and moving it "from me to we." The school's principal, Reg Leidl, said the visit was exciting for his staff and students. "We feel incredibly honoured to have you with us. It's been incredibly profound." Hopkins left them with encouragement. "You are doing the best you can ... it's darn good! Community leaders across Saskatchewan are working every day to protect natural resources and build a strong, sustainable social and economic future. RCE Saskatchewan is a voluntary network of local sustainable development leaders, educators, researchers and UN agencies united under the UN Global Goals. Since 2013, six Saskatchewan sustainability initiatives have earned global recognition from the United Nations University. Hear about and celebrate the 10 years of groundbreaking collaboration that is forging new paths for a sustainable future in Saskatchewan. Meet local sustainability leaders and Dr. Charles (Chuck) Hopkins, UNESCO Chair at York University, who will explain the leadership Saskatchewan and the global RCE network are providing in global education for sustainable development. We hope to see you there! Thank you to Calling Lakes Ecomuseum, a proud flagship project of RCE Saskatchewan, for organizing. We hope you will join us! If you have submitted, please ensure you have received a confirmation email. If not, contact rcesk.event@gmail.com. Applicants will be notified of their outcome the week of April 9. We look to a wonderful event May 2, in Stockholm, Saskatchewan! This year's community host is Macdonald School, a K-9 school with 97 students, 5 teachers and remarkable initiative. They have implemented several school based projects including an outdoor classroom with a brick amphitheatre, storage barn, nature trails, and teepees. They have added a greenhouse & flower gardens and a community Mental Health Gazebo. For more information on this community’s ingenuity watch this Youtube video. Visit www.rceskrecognitionevent.com for event details. We hope to see you there! Have you had success in the past year educating others on sustainable development practices and the importance of sustainability? Share your story and celebrate your success by applying for a recognition award from RCE Saskatchewan! Visit www.rceskrecognitionevent.com for forms, examples of applications from prior years, and our past recipients. The application deadline is March 31, 2018. Questions? Email rcesk.event@gmail.com. Every year, RCE Saskatchewan brings its recognition event to a community in Saskatchewan leading the way in education for sustainable development. This year's community host is Macdonald School, a K-9 school with 97 students, 5 teachers and remarkable initiative. They have implemented several school based projects including an outdoor classroom with a brick amphitheatre, storage barn, nature trails, and teepees. They have added a greenhouse & flower gardens and a community Mental Health Gazebo. For more information on this community’s ingenuity watch this Youtube video. Visit www.rceskrecognitionevent.com for event details. We hope to see you there! 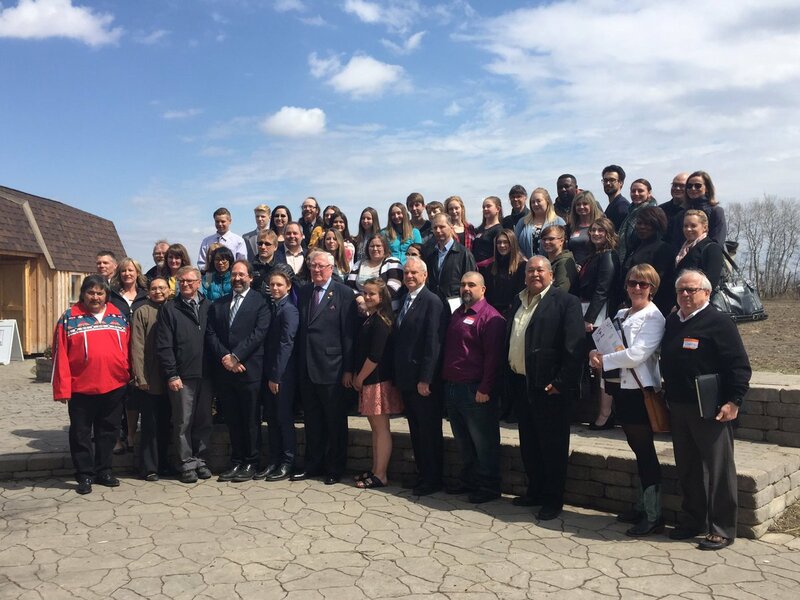 At its 2017 Recognition Event, May 3 in Hafford, SK, RCE Saskatchewan recognized another 25 innovative projects focusing on education for sustainable development. That brings the total to over 200 local projects recognized since the program launch in 2008! The 2017 event also included presentations on the Canadian Committee for [UNESCO's] Man and the Biosphere Programme, Redberry Lake Biosphere Reserve, and Aspen Innovation Park. Thank you to our hosts and program sponsors. Watch here for information on our 10th annual event coming up in May 2018! Follow us on Twitter @saskRCE. The day promises to be very exciting. In addition to the recognition awards in the morning, Saskatchewan Polytechnic, our community host, is planning a very interactive and interesting afternoon featuring its campus and the applied research being done through its diverse sustainability programs just as forestry, fisheries, wildlife, conservation law, and environmental, civil and water resources engineering technology.